Even though OTT is only just beginning to flourish, competition for viewers is high. Providers must seek ways to improve their OTT experience. How can they make their platforms bigger, badder, and better to not only attract new subscribers but retain them after they plunk down their money? In this whitepaper, you’ll learn about the critical challenges facing OTT providers today and how they can be overcome to provide the best possible viewer experience. What Makes the Limelight CDN So Unique? Thanks to Internet-enabled distribution of video content, viewer consumption patterns have radically changed. Viewers no longer rely on traditional television as the sole source of video content. Now they turn to a variety of devices that allow them to consume content on their own terms. As you can see in the graph above1, consumers are employing lots of connected devices to consume non-linear, on-demand, over-the-top (OTT) content. And, as you can probably guess, the amount of online video consumers are watching is growing as well. As exhibited in figure 2, the percent of viewers watching less than 2 hours per week dropped significantly, while the percent watching greater than 2 hours per week rose2. But the challenges that OTT providers face today aren’t about consumption. They are about choice. Consumers are inundated with content. An OTT platform’s ability to stand out from the crowd isn’t just about which movies and shows it offers, it’s also about the experience that platform provides. From the user experience (UX) to content discovery to socialization and engagement, successful OTT platforms need to provide an experience that keeps its audience wanting to come back for more. Contrary to popular belief, over-the-top (OTT) has been around for quite some time. ESPN360, launched in 2005, was probably the first foray into OTT content3 delivery. Since then, dozens upon dozens of OTT providers have launched services as viewers look for alternatives to broadcast delivery or to augment their traditional television consumption. It’s obvious that you need great, compelling content to keep your subscribers happy. But what kind of content will you offer next to keep them engaged and watching more? Enabling viewers to find content that interests them is critical in keeping them engaged with your platform. How will you empower content discovery on your platform? As viewers consume more of your content on their mobile devices, you need to be able to reach them wherever they are. How will you ensure that your platform is ready for a worldwide audience? Because a video can go viral in a heartbeat, be prepared to deal with sudden scale when a flash crowd forms around your content. How will you achieve the scale you need without over investing in infrastructure? Viewers are no longer locked into their television for their video consumption. With an array of devices at their fingertips, they are watching your content wherever, and on whatever device, they want. How do you ensure that your content is viewable on all those devices when your users want it? Quality of Experience is paramount to reducing subscriber churn. You need to provide the best possible content experience by fine-tuning essential KPIs4. How will you maximize the viewing experience to keep customers engaged with your content? Consumers have more choice than ever from whom they will source their video content. How are you protecting your subscriber base? Overcoming those challenges may mean making some fundamental changes to your technology or workflow. To keep your subscribers happy (and away from your competitors’ offerings), you’ll need to build a better mousetrap. Are you ready? Major League Baseball Advanced Media group started off by building an OTT platform to provide MLB fans a way to watch clips and games. They quickly realized that there was a demand in the market from others who wanted to build and launch an OTT platform without all of the encumbrances of going it solo. The MLBAM platform no longer only runs just MLB content. Other OTT services, such as WWE, and NHL.TV are also running on the platform. VOD Factory, based in Paris, offers an end-to-end solution for companies who want to build video on-demand services. This includes building the catalogue from its online library of over 20,000 titles, negotiating rights, preparing content and digital logistics, marketing as well as the building and development of platforms. VOD Factory now has a powerful cloud-based solution that reduces content publishing complexity and speeds time-to-market. Billed as an “end-to-end OTT service platform,” NeuLion has targeted their offering primarily at the live sports market. Offering a full suite of software services as well as a network operations center (NOC) for 24/7 hands-on support, some of their customers include the NBA, NFL, Univision, and Barclay’s Premier League. It’s still very clear—content is king. If you don’t have the right content, the content that your audience wants to watch, then you are dead in the water on day one. The problem is that it seems many providers are offering the same TV shows and movies. That means you need to do something different to gain attention. Whether you are producing your own content or licensing from third-parties, niche content is rapidly becoming very popular. In fact, according to analyst firm MTM, highly targeted OTT providers with niche content (i.e., Dramafever and CuriosityStream) may cause Netflix’s market share to drop to 50% by 20185. To improve your OTT platform experience (and reduce the churn that might be driving you crazy), take a hard look at what you are licensing. If it’s “run-of-the-mill” content that may be available on multiple platforms, you might consider fine-tuning your audience targeting and acquiring more exclusive niche content. Doing so will not only endear you to that target audience but it will also help to differentiate you in the quickly filling sea of OTT providers. Enabling your users to find content is critical to the success of your OTT platform. In the early days of OTT, content discovery was largely done through browsing—users would select the “channels” or “categories” from which they wanted content and then select the content to consume. But that puts a tremendous burden on your audience. In order to find the content available on they want to watch, they have to browse through listings. And if search engines are any indication, if users don’t find the results they want on the first or second page, they aren’t going any deeper. To modernize your OTT platform, start by improving your content discovery functionality. That requires you to implement a recommendation engine to provide a higher degree of personalization—a software component integrated with your OTT platform that analyzes the content consumed by people and recommends similar or related content. To make the most out of your recommendation engine, you’ll need metadata for each title in your library. With the recommendation engine installed, your database will build over time as the software collects data and generates analysis. This upgrade to your OTT platform will ensure that your visitors are presented with new content to consume rather than requiring them to find it on their own! Providing that level of convenience is one aspect of the overall experience that draws viewers back. As viewers have become mobile, they have begun to consume content from a variety of places—waiting in line at the grocery store, during a long cross-country flight, and even while on vacation. But it’s not just the traveling user with which you must be concerned, it’s your global presence. Although you may have created your OTT platform for a specific region and type of content, users will find it, subscribe to it, and expect that you can always deliver your content to them. No matter where they are at the moment, they want to tune in. Failing to meet the needs of these out-of-franchise users may inadvertently damage your brand as they post negative reviews about your service. To give your OTT platform the chops to perform well globally, expand your infrastructure. If you are currently operating your own Content Delivery Network (CDN), you’ll need to implement POPs in all the major locations where you are delivering content. That means analyzing your web logs to determine geographic demand. Once you have that information, you can implement the appropriate infrastructure build-out. Alternatively, you can always partner with a third-party CDN, like Limelight Networks6, that already has a global reach so that you can avoid the costly CAPEX associated with building out your own POPs and datacenters. Time and again, we have seen video content go viral. And when that happens, tens of thousands of users can flock to a single URL. But servicing all those playback requests necessitates the scale to meet it—enough servers with enough capacity with enough bandwidth to handle the load. And if that fails to happen? You increase your chances of buffering, pages and videos failing to load, and other performance-related hang-ups, all of which conspire against your abiltiy to provide the best user experience. Upgrading your scale is a direct result of two things—equipment and bandwidth. You’ll need more of both. Thankfully, you’ve got a few options. First, you can purchase the equipment yourself. With a load balancer, you can ensure that requests are spread out across your entire server farm. Of course, if capacity of the farm is exceeded, you’ll need more. And when you don’t require that much capacity, you’ll have a lot of idle machines. Second, you can employ cloud services that provide you elastic capabilities—your capacity will grow dynamically to meet the needs of your scale and you’ll only be charged for the amount that you use. The problem with that is that most cloud providers aren’t setup to expand globally. Their datacenters are regionally based. Finally, you can use a third-party CDN with a strong, global presence that already has the capacity to service flash-crowds and sudden increases in requests. The battle for control of the family room television is dead. OTT providers are now battling for control of the connected consumer. Viewers are watching your content from a variety of devices. Smartphones. Tablets. Set-top boxes. Gaming consoles. Figure 1, above, illustrates just how many devices consumers are employing to watch your video content on their televisions alone. Delivering your content to multiple devices is no longer a “should I?” it’s a “have to.” And although the online video industry is slowly moving towards just a couple of major formats, different devices may still require different versions—SmoothStreaming, HLS, HDS, MPEG-dash, and even Flash. But pre-encoding all of your content can be an encumbrance. Not only do you need the additional storage (sometimes for formats that may be requested only a few times) but you’ll want extra encoding or transcoding time as well. One way to upgrade this part of your operations is to employ a technology provider that can do the content conversion on the fly by looking at incoming requests. For example, let’s say that you have content encoded for HLS but a request has just come in from a Windows Mobile phone. In this scenario, the technology provider analyzes the device, identifies the required content, automatically converts your HLS-encoded fi le into MMS, and delivers to the requesting user. When a video stops and rebuffers during playback, 21.6 percent of peaople worldwide will stop watching. If a video rebuffers twice, more than 61 percent will stop watching. And when a video rebuffers three times, 84.7 percent of the audience is lost. Only 15.3 percent of viewers will continue watching after a video has rebuffered three times. Figure 3: How many times will you let an online video rebuffer before you stop watching and abandon it? 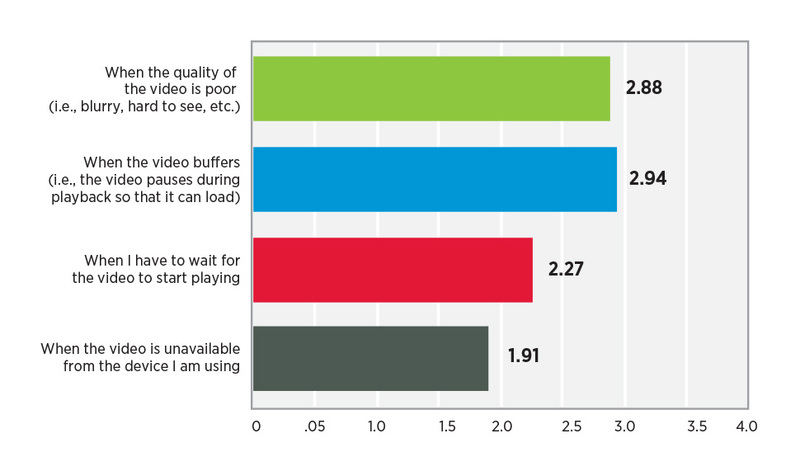 As Figure 3 illustrates, consumers are increasingly frustrated with buffering and other interruptions to their viewing experience. That’s why you have to focus on QoE. Part of that is employing third-party services, like NPAW’s (Nice People At Work) YOUBORA9, that provide detailed analytics about your end-user experience. The other part is bullet-proofing your delivery architecture. If you are using a CDN, you need two. If you are using two, you need three. You get the picture. The more, the merrier!10 And by evaluating the CDNs in real time (using data gleaned from third-party services like Cedexis11) you can switch seamlessly between them to ensure that your users are getting the best possible experience by providing the bulk of your traffic delivery to the partner that is performing the best. But remember…your OTT offering is global, whether you like it or not12. Be sure to select CDN partners with the global scale and availability to support not only current demands, but spikes in traffic. Limelight owns and operates its own private network. This enables it to effectively avoid troubling Internet congestion when delivering video traffic. What’s more, the Limelight CDN is densely architected meaning there are a lot of servers at each of its 80+ global POPs. This ensures that more content can be cached (because there are more edge servers with more storage) resulting in a generally higher cache efficiency. The market is flooding with new OTT providers13. Whether offered by a top tier content owner (such as HBO) or a regional startup, consumers have more options than ever from where to source their online video. And with most OTT providers embracing the subscription video-on-demand (S-VOD) business model, it’s also easier than ever for consumers to disconnect…permanently. So how do you keep your subscribers? How do you generate loyalty and squeeze out attrition? Looking past the obvious—that you need to have compelling, interesting content—there are two service aspects to which you must pay special attention: quality of experience and video delivery performance. Figure 4: What is the most frustrating aspect of watching online video (Rank in order of importance 1 = least frustrating, 4 = most frustrating)? Consumers, especially Millennials, are placing an increased emphasis on video quality. They want crisp pictures. They want high-res. They want broadcast quality. And to deliver on that quality, you need to encode your content in higher bitrates14 and ensure you have the delivery capacity to support your user base at a consistently high bitrate. Online advertising revenue continues to grow as content distributors experiment with different ways to integrate advertising with their programs. 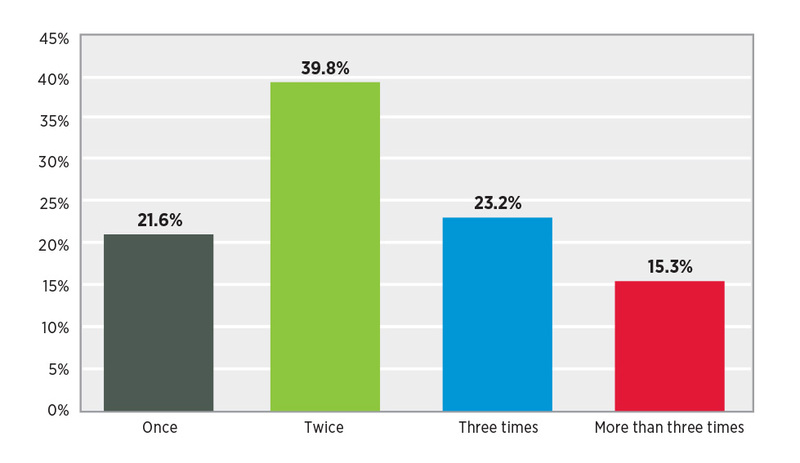 This section takes a look at how respondents feel about advertising in online videos. Globally, 56.9 percent of people find advertising during online videos disruptive, with only 9.0 percent saying it is not disruptive. Although viewers find advertising disruptive, 60.0 percent are willing to accept a short advertisement before the video if the content is free. Figure 6: How do you feel about advertising in online video? However, only 27.4 percent of viewers are willing to accept multiple advertisements in longer duration content, even if the content is free. Figure 7: How do you feel about advertising in online video? Even if viewers are interested in the product being advertised, only 38 percent are accepting of advertising in the program. Figure 8: How do you feel about advertising in online video? While computers and laptops may be the primary device used globally for online video viewing, the use of smartphones is growing rapidly. Smartphones are already the primary viewing device for people who watch the most online video, viewers age 35 and under. In addition, as consumers in emerging regions that do not have a robust fixed broadband infrastructure continue to come online, mobile phones will be their primary method of internet access and online viewing. Mobile connections are often subject to changes in bandwidth and network latencies that can lead to video rebuffering if content is not delivered at the optimal bitrate to match the viewer’s current network conditions. By continually monitoring a user’s connection and optimizing how content is delivered based upon real-time analysis, viewers will receive the highest possible picture quality without experiencing rebuffering. Utilizing a Content Delivery Network (CDN) that has been optimized to deliver a high-quality video streaming experience with low buffer rates will let you provide the experience viewers expect without the frustrations that cause them to abandon content. Consumers are using an increasing number of different devices to view online video throughout the day. In addition to computers and laptops, viewers use smartphones for mobile viewing and dedicated streaming devices for a “large screen” viewing experience. The challenge for content distributors is these devices often require different streaming media formats such as HLS, MSS, and MPEG-DASH. To reach the widest possible audience in a cost-effective manner, content distributors should employ a workflow that makes it easy to deliver content in as many streaming video formats as possible. A solution with device detection and on-the-fly transcoding and transmuxing streamlines the process of preparing OTT content in the appropriate formats needed to support the multitude of devices being utilized by viewers today. In addition, utilizing a video delivery platform that is integrated with a CDN helps provide a low-latency delivery experience for events such as gaming, gambling, and live sports where viewers want to watch the event as close to realtime as possible. We’ve put together a list of resources below for further reading. From case studies to consumer research, this curated content will help you make the strategic decisions that will drive the success of your OTT business. A leading provider of telecom and wholesale bandwidth services to enterprises and consumers in India specializes in global media and over-the-top (OTT) services. They use Limelight’s Orchestrate Platform and video delivery services to deliver OTT content to customers worldwide. An APAC OTT service delivers Mandarin-language content to audiences within China and across the globe. With over two million subscribers, hey operate over 300 channels on global internet portals and video sites such as YouTube, Facebook, Google, Microsoft, and Amazon. Subscribers can choose from Chinese drama, video on-demand, arts, anime, tourism, and more. An EMEA-based OTT platform offers an end-to-end solution for companies who want to build video on-demand services. This includes building the catalogue from its online library of over 20,000 titles, negotiating rights, preparing content and digital logistics, marketing as well as the building and development of platforms. They use Limelight’s video delivery services to deliver MPEG DASH to viewers. Limelight Networks has fielded a number of consumer research reports studying consumer behavior around digital experiences like watching online video and visiting websites. To access a report, click on the report name from the list below. The life-blood of your OTT platform, learn about video viewing behaviors and habits of online audiences, especially the differences between demographics (i.e., Millenials). You aren't just delivering online video; you are providing a digital experience. Find out how people feel about that experience to help fine-tune the way you deliver your video. The Limelight Orchestrate Platform is built upon a global, private backbone network with the speed, capacity, and availability to deliver the experiences today’s audiences demand. This industry-leading Platform includes integrated content delivery, web acceleration, origin storage, video management, cloud security, and support services. The unique combination of global private infrastructure, advanced software, and expert services surpasses other CDNs, to enable today’s and tomorrow’s workflows and put audience experience first. 1Limelight Networks. The State of Online Video. September 2017. 2Limelight Networks. The State of Online Video. September 2017. 10Multi-CDN is rapidly becoming an industry standard for broadcast quality video delivery because it allows the OTT provider to ensure the best possible delivery experience for their end users by switching delivery, in real-time, to the best performing CDN within a specific region. 12Users connecting to your service via VPN can easily get past geo-restrictions. And even if they aren’t supposed to be watching your content, they’ll be the first to post a bad experience with your service. 14We recommend that you create or source your content in 4K (if available). That way, you can prepare significantly high bitrate files for delivery.